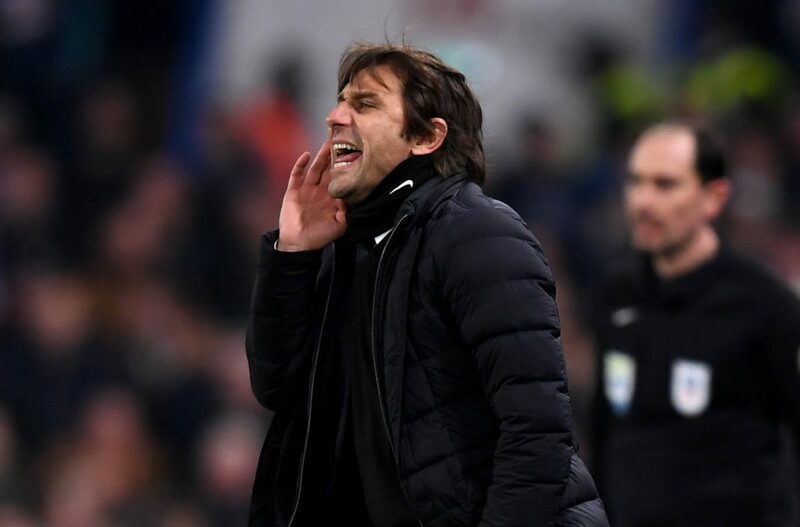 Antonio Conte reacts during the Carabao Cup Semi-Final First Leg match between Chelsea and Arsenal at Stamford Bridge on January 10, 2018 in London. Before the 2017-2018 campaign kicked off, I had written an article discussing what Antonio Conte needed to continue doing for Chelsea to be successful. In my article, I picked out four formations that I believed the Blues would utilize this season (3-4-3, 3-5-2, 4-2-4, 4-3-3), and wrote that Conte’s biggest strength would be choosing which formation to use for which game. What I was correct about was that Chelsea would be moving to a 3-5-2 formation. Conte was slowly trying to adapt last season and finished the job this season by making that Chelsea’s preferred formation. However, what I got wrong, was Conte’s hesitance to adapt. And this has shackled Chelsea this season. There have been several times where the 3-5-2 has made sense to use. Perhaps Chelsea’s 2-1 victory against Atletico Madrid in the Champions League is a prime example of when the formation worked perfectly. However, Chelsea shouldn’t be playing a 3-5-2 against the likes of West Ham. That’s been the problem with Conte this season. It’s not that his ideas aren’t valid, but it is the timing of them which has drawn questions. West Ham, Everton, Norwich City; these teams are always going to set up against the reigning Premier League Champions with the mindset of defense first. They are going to be difficult to break down and they are not going to venture forward often. This is why playing with so few attackers infuriates everyone. Conte needs to be more adaptable against the team he plays against. In the beginning of the season, this is where I highlighted his strength that differentiates him from his other two challengers, Guardiola and Mourinho. Both Manchester managers have very strong ideas about how to play football and not much will change their mind. Take Manchester City’s only loss in the Premier League this season as an example. Liverpool had their number, with their high press being too much for Manchester City. Yet Pep continued to urge his team to play out of the back, even when they had been found out on multiple occasions. There was no flexibility, no change in his scheme, and City ended up paying the price. While Pep has earned the right to be this stubborn, given his record this season, Conte’s unwillingness to adapt has definitely cost the Blues points. Chelsea have a wealth of attacking quality amongst the ranks. However, if you missed the match this weekend against Brighton, you wouldn’t have been reminded of their attacking prowess in sometime. This is due to their formations and style of play. The back three has been a revelation and Conte has brought change across the world with regard to how managers consider different options in setting up their team. Look at how well Swansea played that formation against Liverpool this week. But that revolution was last season. It’s time for something new, something fresh. It’s time for Conte to adapt to a changing environment, as the league had to when he was the trend setter last season. Lower teams are more willing than ever to park the bus and play for a point. Why wouldn’t they? Especially against Chelsea this season. It’s been made almost easy for them to take points off the Blues, given their hesitance to go forward. There is a time and place for every formation that Chelsea can utilize. Play the 3-5-2 against Barcelona in the Champions League. That represents a sensible decision and gives the Blues a chance of advancing. But don’t play it against a lower tier Premier League side. Play a 4-3-3, 4-2-3-1, or a 4-2-4. Give yourself a chance to breakdown teams that have other plans entirely. Utilize the 3-4-3 against bigger clubs in the Premier League. Give yourself a chance to defend against Manchester City, while also ensuring that Chelsea have an outlet and can be dangerous on the counter attack. This is what hampered the Blues back in September against City. They had no outlet and eventually, they were broken down. Conte’s greatest asset is his flexibility. His ability to make decisions on the fly and set his team up for success each week is what allowed Chelsea to win the title last season. If they are to be successful going forward, with whatever competition they are in, Conte must rediscover his ability to be flexible.